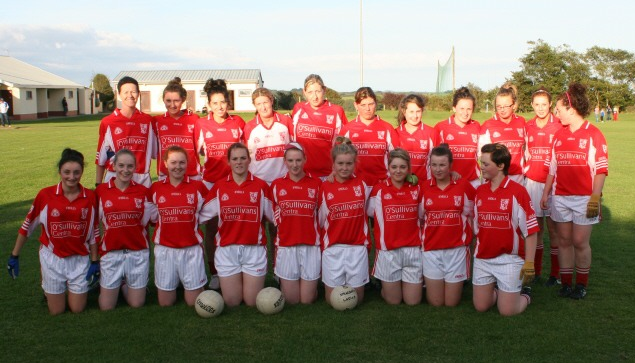 Our Junior ladies team were crowned Junior A champions last Sunday night when they defeated Brickey Rangers on a scoreline of 1.8 to 1.4. Brickey Rangers started off the better team in the first ten minutes and led two points to no score. Chloe Fennell who had an outstanding game got fouled in the penalty area and Nicola Fennell converted to put us in front. Rebecca Casey and Angela Flynn added two points to put us ahead at half time 1.2 to 2 pts. We were unfortunate two minutes before half time as Nicola got sin binned for a foul in the penalty area but Gráinne pulled off a fantastic save denying Brickey Rangers a goal. In the second half the girls upped their game as they were down to 14 players for the first ten minutes but points from Laura Cusack and Sharon Keane put us further ahead. Brickey Rangers replied with a goal but the girls played some fantastic football with Niamh Power and Elaine D'Arcy solid in defence. Cara Mullaney and Sharon Keane added three more points to put us four points ahead and we ran out winners on a scoreline of 1.8 to 1.4. There were great scenes of celebrations after the game with the supporters coming on to the field. Peter Jordan presented the cup to Captain Gráinne Costelloe who thanked the supporters, sponsors and Fraher Field. This was a great team performance and all players 1-25 put in great commitment and hard work through out the year. There are many people that have to be thanked for their commitment and support to the club throughout the year. A big thank you must go to Kieran Heffernan for his time and commitment with the girls and the result showed on the night how much work he put in. We must thank Paul Forsey for his help and support throughout the year. We must also thank our sponsor Virgil Power Forklifts for our jerseys, Nina Fee who did first aid on the night, Pat Power and Anthony Morrissey for videoing the match, Virgil Power for taking photos, Noel Costelloe our Chairman and Fionnuala Flynn for her admin. Work, our water girls Aoife Cunningham and Rachel McGuckian and The Stradbally GAA Club for the field throughout the year. Also thank you to Cess Hearne, Breda Costelloe and Helen Curran for preparing food after the match. This is the second County Final the club won this year, which is a fantastic achievement, and hopefully we can build on this for next year. Our U12's started their season in early June. They played Ardmore, Clashmore, Kilmac and St. Annes, having three wins. The girls qualified for the U12 County final and faced St. Annes in the U12 B County Final in Stradbally on Saturday July 13th. The girls had played St. Annes earlier in the championship and beat them but it they knew this was going to be a tough game. It was a wonderful contest with some great football played and our girls came out on top being victorious in their fourth U12 County Final in a row. There were great scenes after the game with Captain Megan O'Brien thanking all those who came and supported and St.Annes for a great game. Team: Megan O'Brien, Becky Keoghan, Sheena McGuickian, Roisin Dunphy, Sarah Mullaney, Kate Heffernan,Kailyn O'Donnell, Hayley Phelan, Aoife Brazil, Kelsey McGrath, Erica Kiely, Jade Queally, Zoe Kett,Lauren Power, Allanah Doocey, Shiona Dunphy, Ruth Phelan, Emily Rousseau and Louise Casey. On behalf of the club I would like to thank all those who came and supported the girls, Terrence Morrissey for the Jerseys, Deirdre Keane and Tracey Fennell for coaching the girls and all those who helped out training the girls, Melissa Fennell, Eileen O'Brien and Claire Crowley. Their help and support was greatly appreciated.